James Allen of the Adelaide times produced a handful of single issue humorous newspapers of which this is one. Charles Platts, a Hindley Street bookseller, was the printer and publisher. Send-ups of various well-known gentlemen as well as James Allen himself fill the columns of the newspaper. Timothy Short's journal of passing events and First of April cracker appear to be other titles in this series of satirical newspapers, possibly produced as April Fool's Day jokes. An advertisement for the Adelaide gazette extraordinary stated it was, "edited by Corpus Lightbody ... assisted by the Messrs. Manybody, illustrated by Nobody, and read by Everybody." (South Australian register, 22 March 1843, p. 2) The newspaper naturally includes jibes about politicians, describing local elections as a horse race, and sending up the supposed self-importance displayed by some. 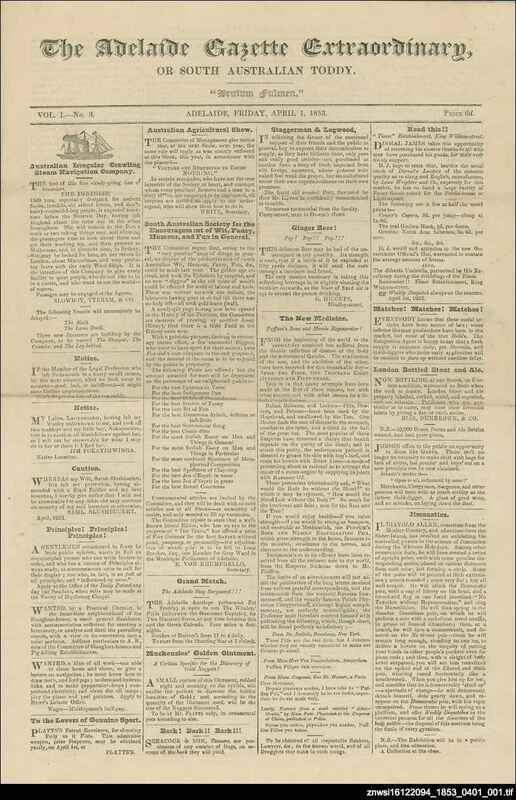 Only this single issue is known to exist, although a prospectus for the newspaper appeared in the South Australian register on 22 March 1845, and references to the title occur through 1846.